"Outperforming all of our competitors in the premium midsize car segment is a reflection of the dedication of all Hyundai team members," said Erwin Raphael, director of engineering and quality, Hyundai Motor America. "Awards like this demonstrate we're succeeding in connecting with our customers through an unprecedented combination of premium performance, technology, safety and quality." In addition to Genesis's victory, the Hyundai brand substantially reduced problems per 100 vehicles and finished tenth overall, gaining eight rank positions. The Hyundai overall score was 106 problems per 100 vehicles, seven problems fewer than the industry average. Accent, Sonata and Azera ranked second in their respective segments. The all-new Santa Fe ranked third in its segment. Hyundai has upgraded its Sonata hybridfor 2013 with a more powerful electric motor, a more fuel efficient 2.4-litre Atkinson-cycle four-cylinder engine and a lighter, but more powerful, lithium-ion battery. The result is a better Natural Resources Canada fuel economy rating (5.4 L/100 km in the city and 4.9 L/100 km on the highway) as well as improved real-word fuel economy. Indeed, in the city, the Sonata hybrid consumed about half as much dinosaur juice as the Fusion EcoBoost - 7.0 L/100 km versus 13.6. Its parsimony continued on the highway although, like other hybrids, the size of its advantage dissipated as speeds increased. By 120 km/h, it was consuming just 1.0 L/100 km less than the Sonata Turbo and the Accord V6. 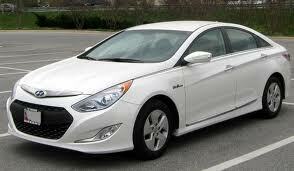 Nonetheless, this and its superior drivability see Hyundai's hybrid much improved. Indeed, though the 2013 is seven horsepower down on the 2012 model, it gains 40 pound-feet of torque, making 2013 hybrid much more responsive.